Godfrey of Bouillon (French: Godefroy de Bouillon, Dutch: Godfried van Bouillon, German: Gottfried von Bouillon, Latin: Godefridus Bullionensis; 18 September 1060 – 18 July 1100) was a Frankish knight and one of the leaders of the First Crusade from 1096 until its conclusion in 1099. He was the Lord of Bouillon, from which he took his byname, from 1076 and the Duke of Lower Lorraine from 1087. After the successful siege of Jerusalem in 1099, Godfrey became the first ruler of the Kingdom of Jerusalem. He refused the title of King, however, as he believed that the true King of Jerusalem was Jesus Christ, preferring the title of Advocate (i.e., protector or defender) of the Holy Sepulchre (Latin: Advocatus Sancti Sepulchri). He is also known as the "Baron of the Holy Sepulchre" and the "Crusader King". Godfrey of Bouillon was born around 1060 as the second son of Eustace II, Count of Boulogne, and Ida, daughter of the Lotharingian duke Godfrey the Bearded by his first wife, Doda. His birthplace was probably Boulogne-sur-Mer, although one 13th-century chronicler cites Baisy, a town in what is now Walloon Brabant, Belgium. As second son, he had fewer opportunities than his older brother and seemed destined to become just one more minor knight in service to a rich landed nobleman. However his maternal uncle, Godfrey the Hunchback, died childless and named his nephew, Godfrey of Bouillon, as his heir and next in line to his Duchy of Lower Lorraine. This duchy was an important one at the time, serving as a buffer between the kingdom of France and the German lands. In fact, Lower Lorraine was so important to the German kingdom and the Holy Roman Empire that Henry IV, the German king and future emperor (reigned 1084–1105), decided in 1076 that he would place it in the hands of his own son and give Godfrey only Bouillon and the Margraviate of Antwerp as a test of Godfrey's abilities and loyalty. Godfrey served Henry IV loyally, supporting him even when Pope Gregory VII was battling the German king in the Investiture Controversy. Godfrey fought alongside Henry and his forces against the rival forces of Rudolf of Swabia and also took part in battles in Italy when Henry IV actually took Rome away from the pope. A major test of Godfrey’s leadership skills was shown in his battles to defend his inheritance against a significant array of enemies. In 1076 he had succeeded as designated heir to the Lotharingian lands of his uncle, Godfrey the Hunchback, and Godfrey was struggling to maintain control over the lands that Henry IV had not taken away from him. Claims were raised by his uncle's estranged widow, Matilda of Tuscany, Albert III, Count of Namur, and Theoderic Flamens, Count of Veluwe. This coalition was joined by Theoderic, Bishop of Verdun, and two minor counts attempting to share in the spoils: Waleran, Count of Arlon and Limburg, and Arnold I, Count of Chiny. As these enemies outside the family tried to take away portions of his land, Godfrey's brothers, Eustace and Baldwin, both came to his aid. Following these long struggles and proving that he was a loyal subject to Henry IV, Godfrey finally won back his duchy of Lower Lorraine in 1087. Still, Godfrey's influence in the German kingdom would have been minimal if it had not been for his major role in the First Crusade. In 1095 Pope Urban II called for a Crusade to liberate Jerusalem from Muslim forces and also to aid the Byzantine Empire which was under Muslim attack. Godfrey took out loans on most of his lands, or sold them, to the bishop of Liège and the bishop of Verdun. With this money he gathered thousands of knights to fight in the Holy Land as the Army of Godfrey of Bouillon. In this he was joined by his older brother, Eustace, and his younger brother, Baldwin, who had no lands in Europe. He was not the only major nobleman to gather such an army. Raymond IV, Count of Toulouse, also known as Raymond of Saint-Gilles, created the largest army. At age 55, Raymond was also the oldest and perhaps the best known of the Crusader nobles. Because of his age and fame, Raymond expected to be the leader of the entire First Crusade. Adhemar, the papal legate and bishop of Le Puy, travelled with him. There was also the fiery Bohemond, a Norman knight from southern Italy, and a fourth group under Robert II, Count of Flanders. "It was at this time that Duke Godfrey, may his bones be ground to dust, arose in the hardness of his spirit, driven by a wantoness to go with those journeying to the profane shrine, vowing to go on this journey only after avenging the blood of the crucified one by shedding Jewish blood and completely eradicating any trace of those bearing the name 'Jew,' thus assuaging his own burning wrath." After being notified of Godfrey's pledge by a messenger from Kalonymus ben Meshullam (the Jewish leader in Mainz), Emperor Henry IV issued an order prohibiting any harm to the Jewish communities. Solomon bar Simson asserted that Godfrey claimed he had never intended to harm Jews, but the Jews in Mainz and Cologne each gave him a bribe of 500 silver marks, and Godfrey "assured them of his support and promised them peace". After some difficulties in Hungary, he arrived in Constantinople, capital of the Byzantine Empire, in November. The Pope had called the Crusade in order to help the Byzantine emperor Alexius I fight the Islamic Turks who were invading his lands from Central Asia and Persia. Godfrey and his troops were the second to arrive in Constantinople (after Hugh of Vermandois). During the next several months the other Crusader armies arrived. Suddenly, the Byzantine emperor had an army of about 4000 to 8000 mounted knights and 25,000 to 55,000 infantry camped on his doorstep. But Godfrey and Alexius I had different goals. The Byzantine emperor wanted the help of the Crusader soldiers to recapture lands that the Seljuk Turks had taken. The Crusaders, however, had the main aim of liberating the Holy Land in Palestine from the Muslims and reinstating Christian rule there. For them, Alexius I and his Turks were only a sideshow. Worse, the Byzantine emperor expected the Crusaders to take an oath of loyalty to him. Godfrey and the other knights agreed to a modified version of this oath, promising to help return some lands to Alexius I. By the spring of 1097, the Crusaders were ready to march into battle. Their first major victory, with Byzantine soldiers at their side, was at the city of Nicaea, close to Constantinople, which the Seljuk Turks had taken in 1085. Godfrey and his knights of Lorraine played a minor role in the siege of Nicaea, with Bohemond successfully commanding much of the action. Just as the Crusaders were about to storm the city, they suddenly noticed the Byzantine flag flying from the top of the city walls. Alexius I had made a separate peace with the Turks and now claimed the city for the Byzantine Empire. These secret dealings were a sign of things to come in terms of relations between Crusaders and Byzantines. Godfrey continued to play a minor, but important,[clarification needed] role in the battles against the Muslims until the Crusaders finally reached Jerusalem in 1099. Before that time, he helped to relieve the vanguard at the Battle of Dorylaeum after it had been pinned down by the Seljuk Turks under Kilij Arslan I, with the help of the other crusader princes in the main force and went on to sack the Seljuk camp. After this battle and during the trek through Asia Minor, some sources suggest that Godfrey was attacked by a bear and received a serious wound which incapacitated him for a time. In 1098, Godfrey took part in the capture of Antioch, which fell in June of that year after long and bitter fighting. During the siege, some of the Crusaders felt that the battle was hopeless and left the Crusade to return to Europe. Alexius I, hearing of the desperate situation, thought that all was lost at Antioch and did not come to help the Crusaders as promised. When the Crusaders finally took the city, they decided that their oaths to Alexius had been breached and were no longer in effect. Bohemond, the first to enter the city gates, claimed the prize for himself. A Muslim force under Kerbogha, from the city of Mosul, arrived and battled the Crusaders, but the Christians finally defeated these Islamic troops. After this victory, the Crusaders were divided over their next course of action. The bishop of Le Puy had died at Antioch. Bohemond decided to remain behind in order to secure his new principality; and Godfrey's younger brother, Baldwin, also decided to stay in the north in the Crusader state he had established at Edessa. Most of the foot soldiers wanted to continue south to Jerusalem, but Raymond IV of Toulouse, by this time the most powerful of the princes, having taken others into his employ, such as Tancred, hesitated to continue the march. After months of waiting, the common people on the crusade forced Raymond to march on to Jerusalem, and Godfrey quickly joined him. As they travelled south into Palestine, the Crusaders faced a new enemy. No longer were the Seljuk Turks the rulers of these lands. Now the Christian army had to deal with armies of North African Muslims called Fatimids, who had adopted the name of the ruling family in Cairo, Egypt. The Fatimids had taken Jerusalem in August 1098. The Crusaders would be battling them for the final prize of the First Crusade in the siege of Jerusalem. It was in Jerusalem that the legend of Godfrey of Bouillon was born. The army reached the city in June 1099 and built a wooden siege tower (from lumber provided by some Italian sailors who intentionally scrapped their ships) to get over the walls. The major attack took place on July 14 and 15, 1099. Godfrey and some of his knights were the first to take the walls and enter the city. It was an end to three years of fighting by the Crusaders, but they had finally achieved what they had set out to do in 1096—to recapture the Holy Land and, in particular, the city of Jerusalem and its holy sites, such as the Holy Sepulchre, the empty tomb of Jesus Christ. He endowed the hospital in the Muristan after the First Crusade. Godfrey of Bouillon being created the Lord of the city. 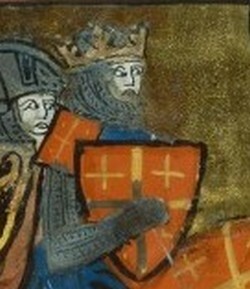 Histoire d'Outremer by William of Tyre, detail of an historiated initial S, British Library Manuscript in the Yates Thompson Collection (No. 12, fol. 46), 13th century. Once the city was returned to Christian rule, some form of government had to be set up. On July 22, a council was held in the Church of the Holy Sepulchre. Raymond of Toulouse refused to become king. Godfrey agreed to become ruler. As was typical of Godfrey's Christian ethics, he refused to be crowned king "upon the plea that he would never wear a crown of gold where his Saviour had worn a crown of thorns". The exact nature and meaning of his title is thus somewhat of a controversy. Although it is widely claimed that he took the title Advocatus Sancti Sepulchri ("advocate" or "defender" of the Holy Sepulchre), this title is only used in a letter which was not written by Godfrey. Instead, Godfrey himself seems to have used the more ambiguous term Princeps, or simply retained his title of dux from back home in Lower Lorraine. Robert the Monk is the only chronicler of the crusade to report that Godfrey took the title "king". During his short reign, Godfrey had to defend the new Kingdom of Jerusalem against Fatimids of Egypt, who were defeated at the Battle of Ascalon in August. He also faced opposition from Dagobert of Pisa, the Patriarch of Jerusalem, who was allied with Tancred. Although the Latins came close to capturing Ascalon, Godfrey's attempts to prevent Raymond of St. Gilles from securing the city for himself meant that the town remained in Muslim hands, destined to be a thorn in the new kingdom's side for years to come. In 1100, Godfrey was unable to directly expand his new territories through conquest. However, his impressive victory in 1099 and his subsequent campaigning in 1100 meant that he was able to force Acre, Ascalon, Arsuf, Jaffa, and Caesarea to become tributaries. Meanwhile, the struggle with Dagobert continued, although the terms of the conflict are difficult to trace. Dagobert may well have envisaged turning Jerusalem into a fiefdom of the pope; however his full intentions are not clear. Much of the evidence for this comes from William of Tyre, whose account of these events is troublesome; it is only William who tells us that Dagobert forced Godfrey to concede Jerusalem and Jaffa, while other writers such as Albert of Aachen and Ralph of Caen suggest that both Dagobert and his ally Tancred had sworn an oath to Godfrey to accept only one of his brothers or blood relations as his successor. Whatever Dagobert's schemes, they were destined to come to naught. Being at Haifa at the time of Godfrey's death, he could do nothing to stop Godfrey's supporters, led by Warner of Grez, from seizing Jerusalem and demanding that Godfrey's brother Baldwin should succeed to the rule. Dagobert was subsequently forced to crown Baldwin as the first Latin king of Jerusalem on December 25, 1100. "While he was besieging the city of Acre, Godfrey, the ruler of Jerusalem, was struck by an arrow, which killed him", reports the Arab chronicler Ibn al-Qalanisi. Christian chronicles make no mention of this; instead, Albert of Aix and Ekkehard of Aura report that Godfrey contracted an illness in Caesarea in June 1100. It was later believed that the emir of Caesarea had poisoned him, but there seems to be no basis for this rumour; William of Tyre does not mention it. It is also said that he died after eating a poisoned apple. In any event, he died in Jerusalem after suffering from a prolonged illness. Godfrey never married. According to William of Tyre, the later 12th-century chronicler of the Kingdom of Jerusalem, Godfrey was "tall of stature, not extremely so, but still taller than the average man. He was strong beyond compare, with solidly-built limbs and a stalwart chest. His features were pleasing, his beard and hair of medium blond." 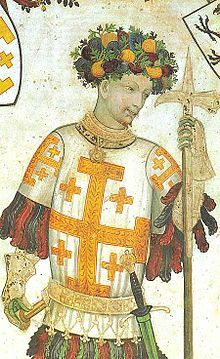 Because he had been the first ruler in Jerusalem, Godfrey of Bouillon was idealized in later accounts. He was depicted as the leader of the crusades, the king of Jerusalem, and the legislator who laid down the assizes of Jerusalem, and he was included among the ideal knights known as the Nine Worthies. In reality, Godfrey was only one of several leaders of the crusade, which also included Raymond IV of Toulouse, Bohemund of Taranto, Robert of Flanders, Stephen of Blois and Baldwin of Boulogne to name a few, along with papal legate Adhémar of Montiel, Bishop of Le Puy. Baldwin I of Jerusalem, Godfrey's younger brother, became the first titled king when he succeeded Godfrey in 1100. The assizes were the result of a gradual development. Godfrey's role in the crusade was described by Albert of Aix, the anonymous author of the Gesta Francorum, and Raymond of Aguilers amongst others. In fictional literature, Godfrey was the hero of numerous French chansons de geste dealing with the crusade, the "Crusade cycle". This cycle connected his ancestors to the legend of the Knight of the Swan, most famous today as the storyline of Wagner's opera Lohengrin. By William of Tyre's time later in the 12th century, Godfrey was already a legend among the descendants of the original crusaders. Godfrey was believed to have possessed immense physical strength; it was said that in Cilicia he wrestled a bear and won, and that he once beheaded a camel with one blow of his sword. Since the mid-19th century, an equestrian statue of Godfrey of Bouillon has stood in the centre of the Royal Square in Brussels, Belgium. The statue was made by Eugène Simonis, and inaugurated on August 24, 1848. Godfrey is a key figure in the pseudohistorical theories put forth in the books The Holy Blood and the Holy Grail and The Da Vinci Code. In 2005 Godfrey came in 17th place in the French language Le plus grand Belge, a public vote of national heroes in Belgium. He did not make the 100 greatest Belgians, as voted by the Dutch speakers in De Grootste Belg (the Greatest Belgian). In the Paradiso segment of his Divine Comedy, Dante Alighieri sees the spirit of Godfrey, together with Roland's, in the Heaven of Mars with the other "warriors of the faith". Pierre Desrey's Genealogie de Godefroi de Buillon, completed in 1499, gives a complete history of the Crusades, starting with the birth of the Chevalier au Cygne (Knight of the Swan), the ancestor of Godfrey, and ending after the accession of Philip IV of France (1268–1314). At least six editions are preserved from the 16th century, published between 1504 and 1580. Torquato Tasso made Godfrey, as "Goffredo di Buglione", the hero of his epic poem Jerusalem Delivered. A Spanish play entitled "La conquista de Jerusalén por Godofre de Bullón" was written in the mid 1580s and known to have been performed in 1586. The play was discovered in the late 1980s by Stefano Arata. It is attributed to and is now widely accepted to have been written by Miguel de Cervantes. It is an adaptation of Tasso's poem and features Godfrey as an ideal of Christian kingship, possibly as a critical parallel to King Philip II of Spain (1556–98). Godfrey is depicted in Georg Friedrich Händel's opera Rinaldo (1711) as Tasso's "Goffredo". The Blue Gonfalon by Margaret Ann Hubbard, which follows Godfrey and his men on their journey to the Holy Land. It is told through the eyes of Bennet, Godfrey's squire. Godfrey de Bouillon, Defender of the Holy Sepulchre, by Tom Tozer. Godfrey's sword is given satirical mention in Mark Twain's The Innocents Abroad (1869). ^ Butler, Alban; Burns, Paul (2000). Butler's Lives of the Saints. Continuum International Publishing Group. p. 93. ISBN 0-86012-253-0. ^ "The tomb of Godfrey was destroyed in 1808, but at that time a large sword, said to have been his, was still shown." L. Bréhier, "Godfrey of Bouillon" in The Catholic Encyclopedia (1909). ^ a b Simon John (23 November 2017). Godfrey of Bouillon: Duke of Lower Lotharingia, Ruler of Latin Jerusalem, c.1060-1100. Taylor & Francis. pp. 186–187. ISBN 978-1-317-12630-0. Retrieved 26 February 2018. ^ Norman Golb (4 May 1998). The Jews in Medieval Normandy: A Social and Intellectual History. Cambridge University Press. p. 123. ISBN 978-0-521-58032-8. Retrieved 26 February 2018. ^ Shlomo Eidelberg (1996). The Jews and the Crusaders: The Hebrew Chronicles of the First and Second Crusades. KTAV Publishing House, Inc. p. 25. ISBN 978-0-88125-541-6. Retrieved 26 February 2018. ^ Whitworth Porter (2013). A History of the Knights of Malta. Cambridge Library Collection - European History. Cambridge University Press. p. 18. ISBN 9781108066228. Retrieved 20 May 2014. Refusing the title of King and the diadem which were offered him, upon the plea that he would never wear a crown of gold where his Saviour had worn a crown of thorns, he modestly contented him with the title of Defender and Advocate of the Holy Sepulchre. ^ Jonathan Riley-Smith, "The Title of Godfrey of Bouillon", Bulletin of the Institute of Historical Research 52 (1979), 83–86; Alan V. Murray, "The Title of Godfrey of Bouillon as Ruler of Jerusalem", Collegium Medievale 3 (1990), 163–78; and John France, "The Election and Title of Godfrey de Bouillon", Canadian Journal of History, 18:3 (1983), 321–29. ^ Marjorie Chibnall (Select Documents of the English Lands of the Abbey of Bec, Camden (3rd Ser.) 73 (1951) pp. 25-26) followed earlier writers in suggesting that since the names Godfrey and Geoffrey shared a common origin, Godfrey is identical to the Geoffrey of Boulogne who appears in English records, marrying Beatrice, daughter of Geoffrey de Mandeville and that he left behind in England a son, William de Boulogne (adult by 1106, died c. 1169). However, Alan Murray analyzed the argument in detail and concluded that contemporary documents clearly distinguish between the two names, and as there is no evidence for their identity and traditions of the Crusade indicate Godfrey was unmarried and childless, the two must be considered to have been distinct. Geoffrey, the English landholder, was apparently an illegitimate brother of Godfrey, the Crusader. Murray, Alan, The Crusader Kingdom of Jerusalem: A Dynastic History 1099-1125 (Unit for Prosopographical Research, Linacre College, Oxford, 2000) pp. 155-165. ^ Holböck, Ferdinand (2002). Married Saints and Blesseds. Michael J. Miller, translator. Ignatius Press. p. 147. ISBN 0-89870-843-5. ^ Weill, Isabelle; Suard, François. "Genealogie de Godefroi de Buillon de Pierre Desrey" (in French). Università degli Studi di Milano. Retrieved 2015-12-22. Andressohn, John Carl. The Ancestry and Life of Godfrey of Bouillon. Indiana University Publications, Social Science Series 5. 1947. "Godfrey of Bouillon". New Advent Catholic Encyclopedia. Retrieved 2007-04-29. "Godfrey of Bouillon". Internet Medieval Sourcebook: The Crusaders at Constantinople: Collected Accounts. Retrieved 2014-05-18. Holböck, Ferdinand (2002). Married Saints and Blesseds. Michael J. Miller, translator. Ignatius Press. p. 147. ISBN 0-89870-843-5. Albert of Aix (fl. 1100), Historia Ierosolimitana, ed. and tr. Susan B. Edgington, Albert of Aachen: Historia Ierosolimitana, History of the Journey to Jerusalem. Oxford: Oxford Medieval Texts, 2007. The principal source for Godfrey's march to Jerusalem. Ekkehard of Aura (d. 1126), tr. W. Pflüger, Die Chronik des Ekkehard von Aura. Leipzig, 1893. William of Tyre (d. 1186), Historia, ed. R. B. C. Huygens, Willemi Tyrensis Archiepiscopi Chronicon. Corpus Christianorum Continuatio Medievalis 38. Turnholt: Brepols, 1986; tr. E. A. Babcock and A. C. Krey, William of Tyre, A History of Deeds Done Beyond the Sea. Columbia University Press, 1943. Zimmern Chronicle, 16th-century chronicle which includes some legendary material.